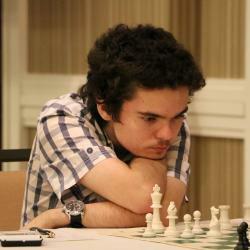 One of the top junior chess players in the world, Illya Nyzhnyk has risen to the top of the chess world at a young age. He had an almost perfect tournament performance with a 2633 rating performance before he was even an International Master! He’s trampled over all players he’s faced in order to reach the level he’s at now. With even more room to improve though, he is sure to be on the radar and knocking on super-Grandmaster status within a few years. Illya Nyzhnyk learned to play chess at the age of 4 years old. He had early tournament success such as when he won the U-10 Ukrainian youth championship in both 2005 and 2006. He also won the U-12 championship in 2006 and the U-16 championship in 2008. His first huge tournament success that drew worldwide attention was in 2007 when he won the Group B of the Moscow Open. What was stunning was that he score 8.5/9 with a 2633 performance against a field of 324 strong players before he was even an International Master! He became a FIDE Master 2007 as well. He earned his norms in the following years and became an International Master in 2009. Before becoming an International Master though, Nyzhnyk won the Nabokov Memorial in 2008 as well as the U-16 European Championship. After he became an International Master, he won the Groningen Chess Festival in 2009 as well. He also earned his second Grandmaster norm at this event and had a performance rating of 2741. In the following year, 2010, he also won this same tournament again and scored his third Grandmaster norm. This made Nyzhnyk the youngest Grandmaster in the world at the age of 14 years 3 months and 2 days. This broke Richard Rapports previous record for youngest Grandmaster. Nyzhnyk broke through the 2600 rating barrier in 2012 at the European Individual Championship. Since becoming a Grandmaster, Nyzhnyk has continued to improve and is currently ranked as the second best player in the world under the age of 18. He is now enrolled in Webster University and is sure to improve while he is surrounded by top players on his team and under the mentorship of Susan Polgar and the SPICE program.